Each February, the American Dental Association (ADA) sponsors National Children’s Dental Health Month to raise awareness about the importance of oral health. At Milestone Orthodontics, we want to get our patients aware of this important subject. 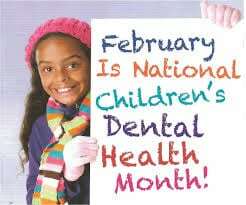 Why is this type of celebration—and year-round attention to children’s dental health–important? Here at Milestone Orthodontics we encourage developing good habits at an early age and scheduling regular dental visits. By developing these good habits, it helps children get a good start on a lifetime of healthy teeth and gums. Despite the fact that it’s almost entirely preventable, tooth decay is the most common chronic disease in children. More than 40 percent of children ages 2 to 11 have had a cavity in their primary (baby) teeth, and more than two-thirds of 16- to 19-year-olds have had a cavity in their permanent teeth. Although overall rates of tooth decay have decreased over the past four decades, decay has actually increased in preschool age children in recent years. The good news is there are safe and effective preventive measures that can protect teeth. Good oral hygiene practices such as thorough brushing with fluoride toothpaste can help keep children from getting cavities. In addition, dental sealants and community water fluoridation are two other strategies that can help prevent tooth decay. Here at Milestone Orthodontics in West Orange, NJ we promote good oral hygiene and are available for our client’s questions. Don’t hesitate to contact us with your concerns.